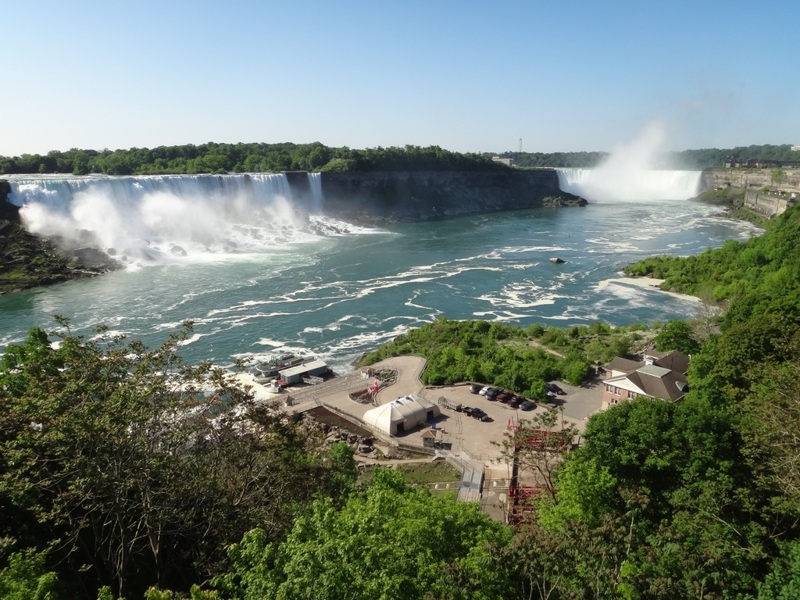 Photograph 1 - Our first exposure to the famous Niagara Falls, from the Canadian side. 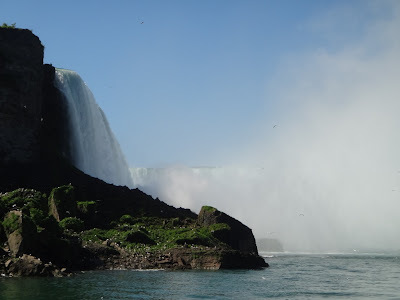 Photograph 2 - Approaching the Horseshoe Falls on the Maid of the Mist, Niagara Falls. Photograph 3 - The Horseshoe Falls from the Maid of the Mist, Niagara Falls. Photograph 4 - The Skylon Tower, Niagara Falls, on the Canadian side. 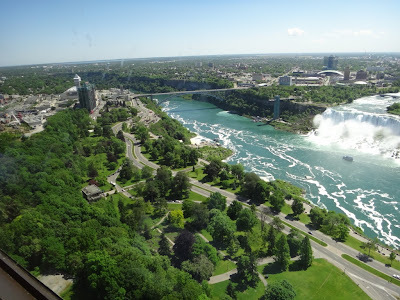 Photograph 5 - View of the American side and the border crossing from the Skylon Tower, Niagara Falls. Photograph 6 - Panorama view of Niagara Falls from the Skylon Tower. 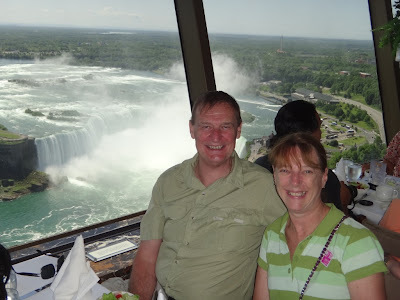 It's us having lunch in the Skylon Tower's revolving restuarant, Niagra Falls, Canadian side. Photograph 8 - One last picture of Horseshoe Falls from the Skylon Tower.----------------------------------------------------------------------------------------------------------------------------------------------------------------------------------------------------------------------------------------------------------------------------------------------------------------------- We left Toronto at 6:15am and it took 90 mins to reach the Canadian side of Niagara Falls. Toronto is a huge city however I don't think we would ever want to go back. It was okay however we have seen all there's to see from our perspective. Definitely the highlight was the CN Tower. 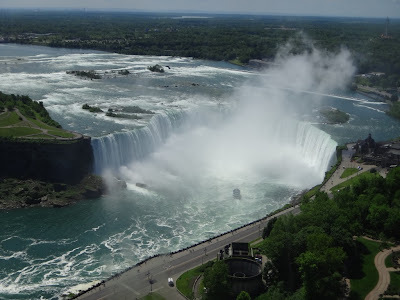 Now about Niagara Falls - it is magnificent. We had a crystal clear sky and from the Skylon Tower we could see as far as Toronto and Buffalo - many many miles away. As we have seen Iguazu Falls in South America between Brazil and Argentina back in 2010 - that particular falls is somewhat larger and supports much more water than Niagara Falls - we felt that Niagara Falls is too comercialised. There are casinos, Sky Towers, fun parks and everything that concrete can support around its perimeter - both on the American and Canadian side. For Iguazu Falls it still is in its pristine environment and one can appreciate the splendour. Nevertheless Niagara Falls is amazing. 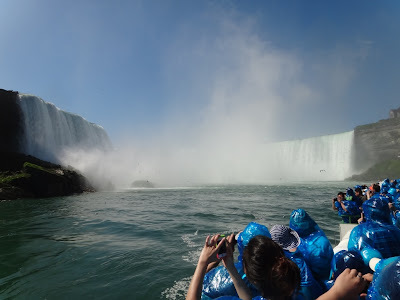 When we arrived we visited an Imax cinema and watched a historical 30min show about the Falls and then we tried to beat the crowds (bloody Japanese tourists) and boarded the Maid of the Mist that sails under the Horseshoe Falls. If you were not wearing the supplied poncho you get wet. 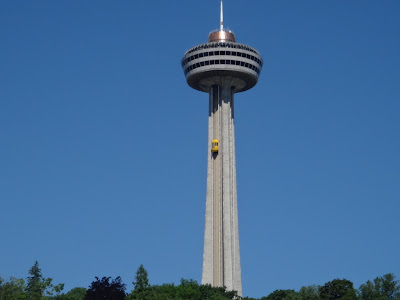 After the boat ride we ascended the Skylon Tower and had an excellent lunch at their revolving restuarant. All these tourists sites are on the Canadian side. Our guide "Joe" arranged all this and is commended how he managed to allude the big crowds. As one could imagine as you can see in the above post we took many photographs. Note the clear and sunny day we experienced. We left Niagara Falls about 1230pm cross over to the American side and headed directly to Boston arriving at 8pm. The entire day's journey was over 800 klms - wow! We settled in to our hotel on Tremont Street, had a meal at our favourite restuarant Max & Dylans (for Clam Chowder) and prepared for our train trip back to Washington DC tomorrow. We enjoyed Boston and highly recommend to any Ozzies who is going to the eastern side of the US to visit this excellent city. Cheers for now.